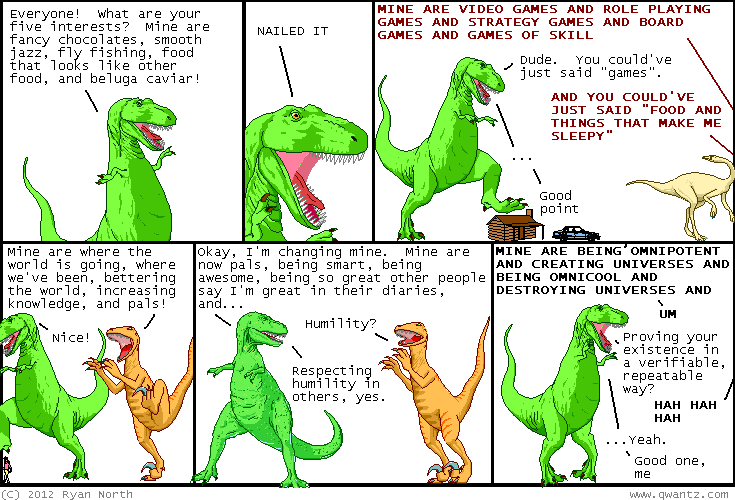 Dinosaur Comics - May 31st, 2012 - awesome fun times! –Okay: THAT was the craziest dream, cats and kittens! May 31st, 2012: Tons of awesome people made character generators based off of yesterday's comic! Bam! Bam! Bam! Bam! There is even a Twitter bot that posts a new one every 30 minutes. This bot joins the @qwantz bot, who will reply to any twitter posts you mention him in with a random line of dialogue. Is it oracle-level advice? You - can read it as such? One year ago today: batman's t-rex story: "guys, i put him in my lair"